Designed as way for the best local runners to compete against the world’s best and attract elite, big-name runners to the race, the Chase in the past has featured elite runners like Patrick Makau, who holds the world record for the marathon (at 2 hours, 3 minutes and 38 seconds), and Jimmy Muindi, who holds the course record for the Honolulu Marathon. Team Hawaii, a group of the best runners across the state (listed here on the event’s official website), will be given a head start on Makau and Muindi, who will be the “Chasers” for this year’s race. Their job will be to catch up and pass every runner in the Team Hawaii team, and then cross the finish line before them. Whoever makes it to the finish line in Kapiolani Park first — whether they’re from Team Hawaii or the Chasers — will be crowned the winner. For everyone who’s not in these elite groups — which is nearly all of us, right? — the course offers up plenty of gorgeous Hawaiian scenery, from the starting line near the Duke Kahanamoku Statue on Kalakaua Avenue (named for the five-time Olympic medalist in swimming who was later one of the earliest popularizers of surfing). From there, runners head west and north along Kalakaua Avenue and Ala Moana Boulevard, all the way to the turn on Smith Street. After that, runners head back down Ala Moana down the route they’ve just run, all the way to Diamond Head Crater State Monument, where they’ll run all the way around the 475-acre park that circles what is perhaps Honolulu’s most famous site. 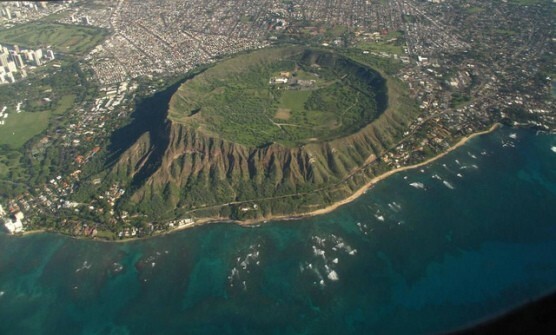 Called a tuff volcano for the rock it is made of, Diamond Head erupted some 300,000 years ago, leaving the crater we know today, which is now filled with hiking trails and some of Hawaii’s most spectacular views. “The race is organized by the Honolulu Marathon, and much of the course is the same as the marathon course — it is very scenic and takes your through Honolulu and then around Diamond Head. “The race begins in Waikiki Beach and goes through the streets of Honolulu, taking in downtown. You’ll run past iconic buildings such as the Ionali Palace, which is the only royal palace in the United States. “Going back toward Waikiki and down Kalakaua Avenue, the course remains flat until mile 9 when there is a incline going around the volcanic crater of Diamond Head. The course ends in Kapiolani Park at the Honolulu Marathon finish line where the post-race food is malasadas. To cool down, walk 100 yards to the ocean! Unforgettable. Nestled along the southern shore of Oahu, which lies between Kauai and Molokai in the Hawaiian islands, Honolulu typically sees mild to warm weather and usually little rainfall in April, a month that has brought record temperatures here as low as 56 degrees (in 1958) and as high as 91 degrees (in 1996). On race day (April 14), the average low is 68°F and the average high is 83°F. See the race route map for the Hapalua Half Marathon here. To reserve your spot in the early spring 2019 running of Honolulu’s Hapalua Half Marathon, register online at the event website below. Ever run in the Hapalua Half Marathon? Share your impressions here, or post your review in the Comments box below. Any opportunities to Volunteer for visitors accompanying racers?